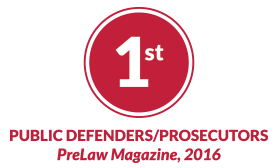 The winter issue of preLaw magazine lists the UNM School of Law number one for Public Defenders/Prosecutors. Curriculum at the UNM Law School features over 100 classes beneficial to a public interest practice, and many of them are experiential. Professor and Dean Emeritus Leo M. Romero who has served the state of New Mexico for decades in the areas of criminal law, judicial selection, and most recently, bail reform teaches the Criminal Law in Practice course, in which students are assigned to either the Law Office of the New Mexico Public Defender or the Second Judicial District Attorney’s Office. Each student has a supervisor, works on real cases, and can appear in court under the Student Practice Rule. “This course, like our required clinic and externships, provides students with practical experience that bridges the classroom and the courtroom, and it helps them develop the skills essential in dealing with clients, witnesses, opposing counsel, and judges,” said Romero. He added that the Public Defender and District Attorney offices also benefit. This course can serve as a breeding ground for new hires, resulting in many of our graduates being hired into these public service positions. The UNM Law School’s partners in the public sector of the legal community help foster the passion and professional development of law students through externship supervision, hands-on mentorship, fellowship funding, scholarships, and by training them directly in the classroom as members of the law school’s adjunct faculty. The study is based on employment (50 percent); curriculum (40 percent) and financial (10 percent). Financial is based on: public salary (40 percent); debt (40 percent); and a Loan Repayment Assistance Program (20 percent). Of the UNM Law School Class of 2015, 46.8 percent were employed in the public sector—over 20 percent higher than the national rate of 26.4 percent. The new ranking speaks to the UNM Law School’s commitment to its mission, which is to educate and train students to become excellent lawyers who will enrich and serve local, state, tribal, national and international communities after graduation.